Effective this month, Perfect Wedding Guide has made updates to the business profiles on their website. Perfect Wedding Guide is excited to announce a major update to the website. 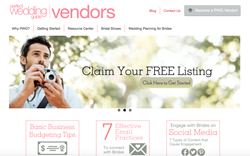 This update is geared towards wedding professionals and their business profiles on our site. (1) Photos. Each business profile now hosts a carousel feature at the top of the page. This carousel will let users quickly scroll through the photos with ease. Photos are the number one media resource that customers seek on business profiles, particularly in the wedding industry. (2) Reviews. 92% of consumers are looking for reviews as well as photos. Therefore, we wanted to make sure that they are easier to find. The business ratings have been moved, along with details to the top of each business profile page. (3) Contact Forms. Having a clear call-to-action is the different between getting results and missing opportunities. The new contact form now appears on your business profile, and follows the users as they scroll down the page. A photo gallery (think Pinterest) has been created to improve the usability and Search Engine Optimization of each business. This new layout will allow users to see all of our photos at a glance. That’s not all. The vendor photo upload interface has been updated. This new feature includes an option that allows for easy upload of multiple photos at a time. Everyone knows Millennials crave photo content, therefore vendors will win big when it comes to creating stellar representation of their business on Perfect Wedding Guide’s website with this update.